Here's a my build up of AMT's '72 "old pro" Chevy Nova SS350 kit. 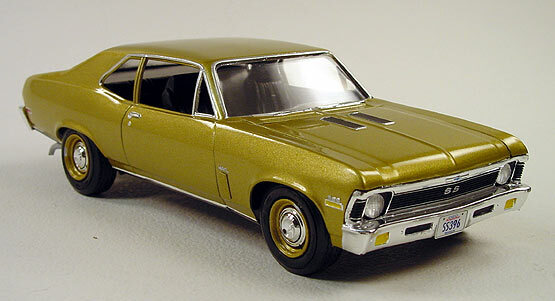 Except, I converted it to a '69 Chey Nova SS396. The real car was a sleeper. To change the body back to a '69, I created the little vents on the front fenders with stryeen plastic strips. I added a big block motor from my model car kit parts box. Also I added a set of resin dog-dish style hub caps and steel wheels from another kit to help re-inforce it's sleeper image. The paint is a factory gold color.